Given our recent performance, there’s plenty of reasons to just stay home and watch the cricket. Having said that, when the opportunity to chase a Qube Logistics freighter during daylight hours on the west arises, it’s a convincing case to get off the coach and get a plan in motion. 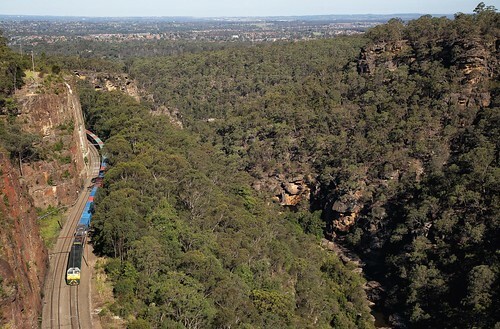 This was how, when many were settled in front of the TV, we found ourselves peering over a cliff into Glenbrook Gorge, looking for trains. We arrived at the gorge at a little after 2pm. Content to laze in the shade (occasionally panicking when we imagined we heard a family of brown snakes stealthily moving towards our position) and watch the NSW TrainLink Blue Mountains services drifting down the mountain. Finally, as the clock approached 5pm, some action! A diverted (and delayed) 7SP5 Pacific National superfreighter to Perth was photographed grinding up the grade towards Glenbrook Tunnel behind NR Class locomotives 67, 23, 76 and 116. 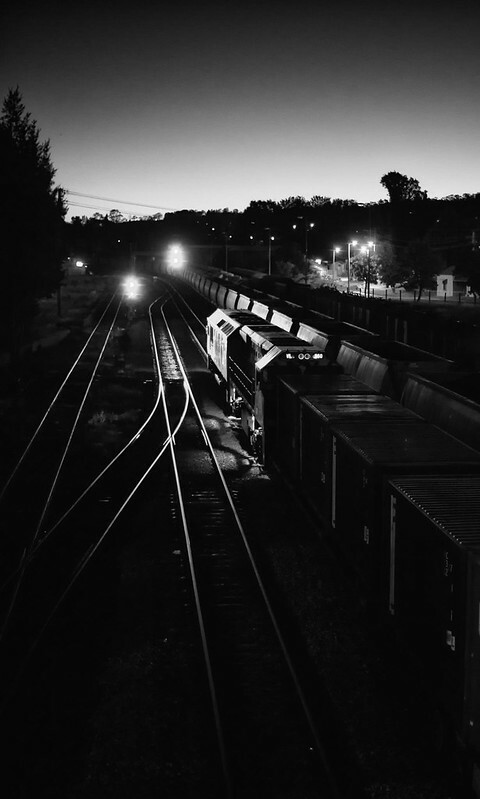 Following only a few signals behind them was the train we were waiting for – Qube Logistics freight 1813 from Port Botany to Dubbo. As the motive power was to be a surprise, we murmured about what could be up front as the roar of EMD engines slowly became more and more obvious. Could it be the 1100 Class? Perhaps a VL? Even maybe an older class! 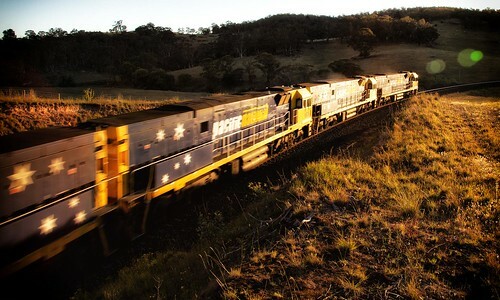 We were not kept guessing for long, the sun reflecting from the angled front of an RL Class, with the trailing unit displaying the distinctive silver colour scheme of CFCL Australia – a VL Class. The chase was on. Given the location we were using was a good ten to fifteen minute walk away from the carpark, we ambled back in our own time, again wary of snakes. A quick stop at a friendly takeaway shop on the Glenbrook main street and we were on our way. We didn’t expect to catch 1813 before Mount Victoria, so we set a course for Sodwalls (south-west of Lithgow). 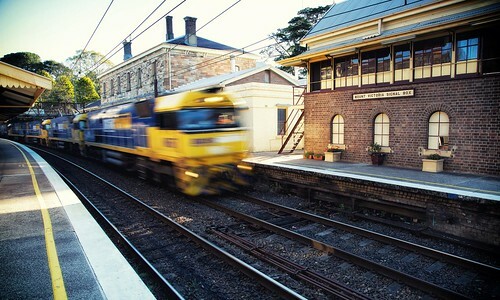 Imagine our surprise when we came alongside the train again at Hazelbrook! Clearly the crew of 1813 knew they were following a heavy superfreighter, and were just taking it easy up the mountain, ensuring that they were following clear signals rather than coming up on yellows and reds. 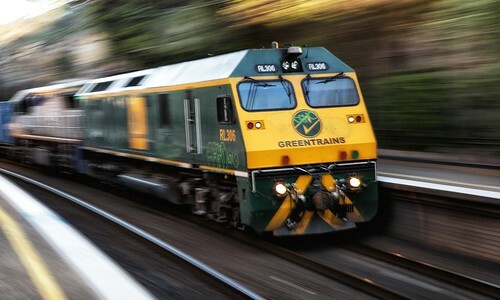 Disappointingly, I noticed as we overtook that RL306 had some scribbled graffiti on the nose and side of the unit, and my heart sank – there’s no reward in photographing locomotives that look like a toddler was let loose with a crayon. 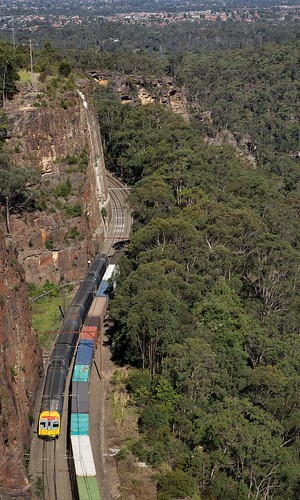 By the time we were passing through Katoomba, we had overtaken 7SP5 as well. This was a cause for concern – with a NSW TrainLink intercity service to Lithgow following 1813, we were worried that train control would put 1813 “into the hole” at Katoomba to allow the passenger service to overtake. Agreeing that we were better off not getting too far ahead of either train, we sidled into the carpark at Mount Victoria station and lined up our shots. 7SP5 passed through at 1824, with the Qube train less than ten minutes behind it at 1832. Down the mountain we went and out to Sodwalls, where we saw other photographers chasing 7SP5. Whilst they opted to tear down an access road for a perfect sunny shot, we were content to stand on a road bridge and shoot into the sun for a trailing shot instead. 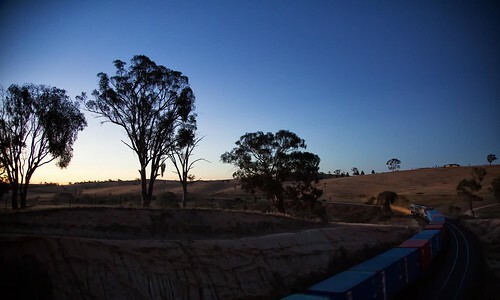 As the wagons drifted through the long curve, the sun went off the line completely, plunging the area into shade. With traditional photography now dead, we reverted to motion based shots, using the movement of the train and slower shutter speeds to our advantage. Given the scribble on the lead RL, this suited me fine, and I was content to experiment. This removed the pressure of trying to get “that perfect roster shot”, and it was quite easy to just run with the changing conditions. As it was, 1813 proved nearly impossible to keep up with, racing through Tarana, Tarana Quarry and Gemalla without slowing. 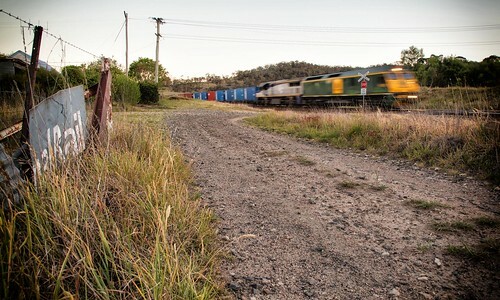 We finally screeched to a stop at Wambool for a rushed shot of an up Qube Logistics freight (8164 from Dubbo to Port Botany), and then a trailing photo of 1813. After Wambool, we entertained the thought of getting another shot at Bathurst, although by the time we had parked, 1813 was already waiting at the departure signal at the Blayney end of the yard! At that point we were content to just give up and head for home.